I was putting my son to bed the other night when he pointed out that his lamp shade was tilted. He of course wanted to go fix it, but I asked if he could wait just a minute so I could snap a picture. 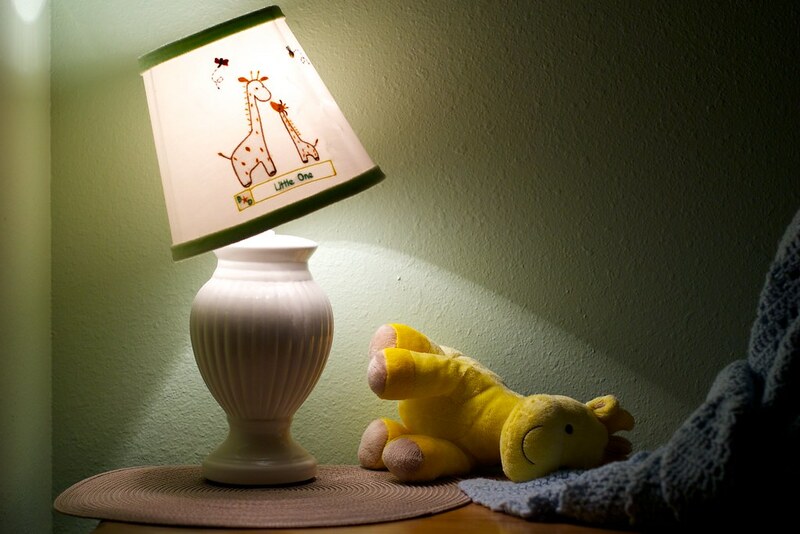 Something about the off-kilter shade kind of struck me, especially since his toy giraffe was lying next to the lamp. It wasn’t until I was going through the pictures later on that I realized (duh) there were also two giraffes on the lamp shade itself. Kind of a cool bit of serendipity, really. I believe this was a 40-watt bulb, and pointing my D200 straight at it I was able to go down to ISO 200 which helped maintain a lot of the texture and detail in the plush giraffe, not to mention the wall. I love this photo! Definitely a keeper.